Beautiful! Soft layers of English netting over satin and tulle. 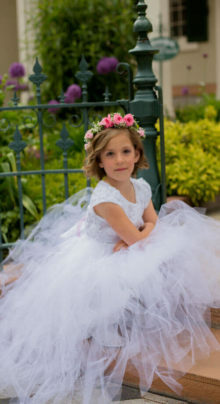 Attached rose colored chiffon at waist is simply luxurious and adds just enough color to make this a favorite pick of young girls for Baptism and brides looking for the perfect flower girl dress. Ties in the back for the perfect fit. 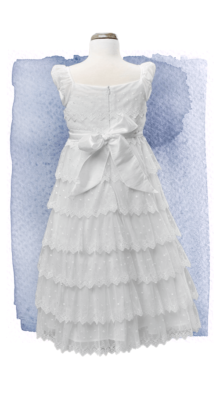 White taffeta is the perfect choice for this unique dress with pleats from neckline to waist. 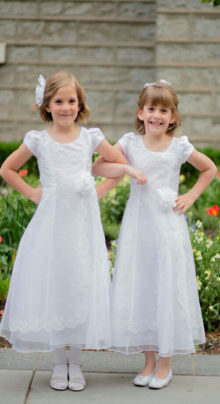 Ornate beaded waist is accentuated with taffeta daises that coordinate with flowers on left shoulder. 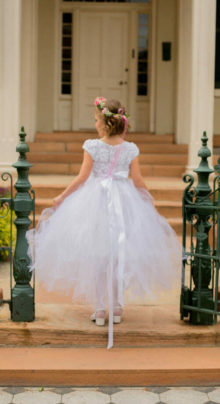 Two layers of lined tulle give this creation the fullness little girls dream of for their big day. 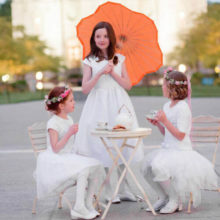 White Elegance designers just can’t help themselves creating the most charming Baptism and special occasions outfits. We’ve taken soft eye-lash lace, and lined it with white denier for a up-scale top to match our layered English net, fully-lined skirt. Girl’s love the fun personality of this combination and can mix and match the pieces with other simple pieces in their closet for a whimzical look. NO RETURNS OR EXCHANGES. Exquisite! The details on this heirloom gown are just short of perfection. From the soft, delicate lace embellished with rainbow crystals to the precision piping around the neck and perfectly created empire band with rose, pearl and rhinestone embellishment. 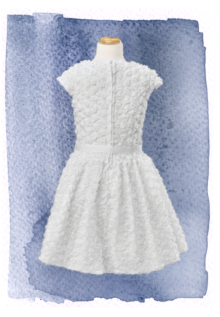 A layer of tool over soft cotton lining, give this White Elegance Arabian Knights dress just the right amount of fullness. 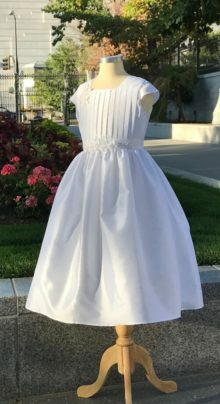 You’ll want to preserve this dress for future generations as it is beautiful for any special occasion such as Baptism, holidays or weddings. Soft, raised lace with just a touch of sheen makes up our Ginger Snap fully-lined, wrap top that ties in the front, side or back. We’ve paired it with our Fairy Garden, fully-lined, handkerchief skirt for a fresh take on a chic white outfit perfect for special occasions. Girls love mix and matching these two fun pieces with their other wardrobe pieces including denim and colorful knit tops. The skirt is fully lined as well and has a 2 inch wide elastic novelty waistband so popular on contemporary skirts. NO RETURNS OR EXCHANGES. Layers and layers of soft, hand cut tulle are delicately attached to a ribbon embroidered lace bodice fully lined in soft satin. This dress is a work of art. The shabby chic design will be an heirloom favorite. Get your camera ready…stunning. NO RETURNS OR EXCHANGES. If your girl loves to twirl, this is the dress. 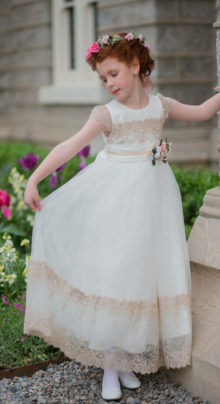 Soft, shabby chic lace lines the back and front of the bodice and sleeves. Soft chiffon is sheared at empire waist and ties in the back for a perfect fit. 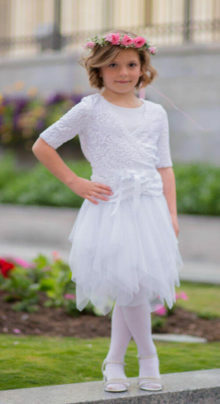 We love this dress for LDS Baptisms, flower girl or First Communion. 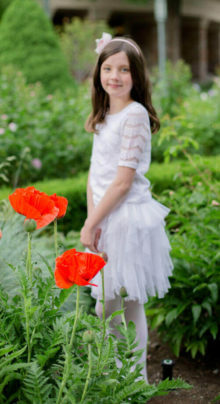 A wonderful dress for fuller size girls. 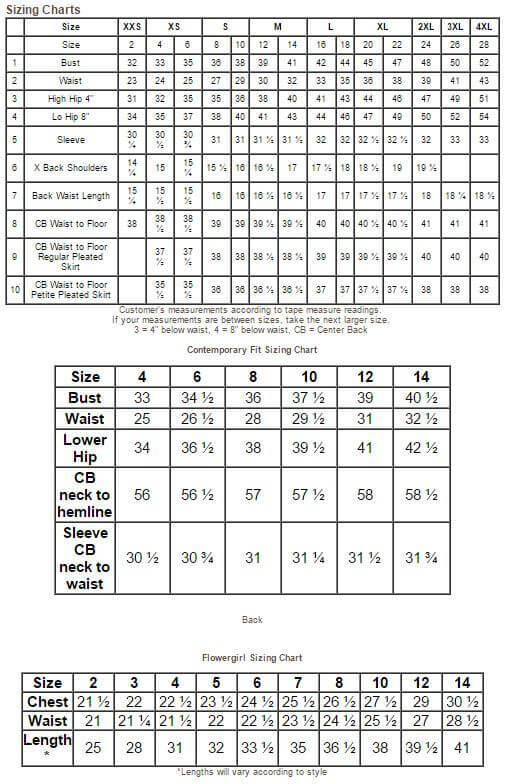 See below for measurements. Size 6: 30″ at empire waist, 37.5″ shoulder to hem length Size 8: 32″ empire waist, 39″ length Size 10: 32″ empire waist, 40.5 length Size 12: 33″ empire waist, 42″ length Size 14: 35″ empire waist, 44″ length Size 16: 37″ empire waist, 45.5″ length. 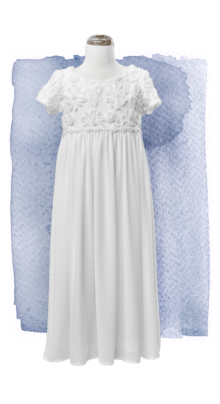 Exquisite organza is accentuated with embroidery throughout the front from top to bottom. 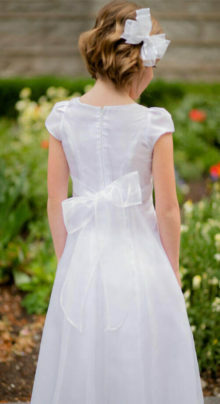 Beautiful side drape has a sweet scalloped edge and finishes at the waist with an organza flower. 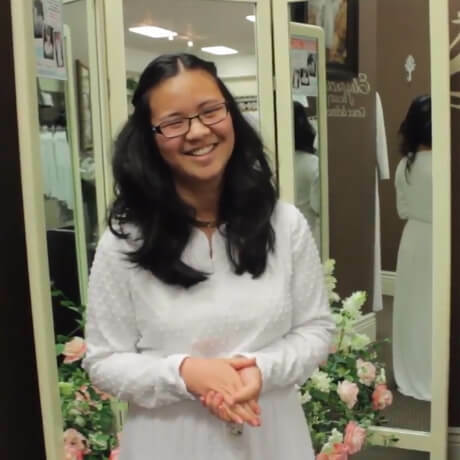 A favorite style for LDS Baptism or First Communion. 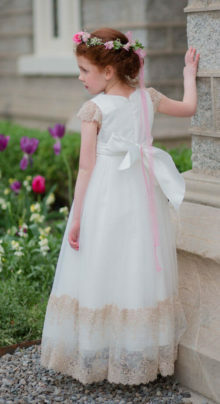 If your little one loves lace, this is the Baptism or Communion dress for her. 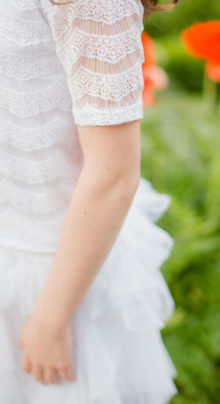 Delicate layers of tricot lace with scattered embroidered dots, flowers and scalloped edges. Simple square neckline and cap sleeve. Satin tie in the back allows for a perfect fit. 100% Polyester. It really is The Bee’s Knees-the height of cuteness. 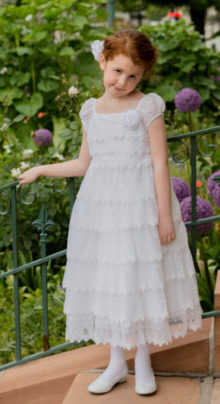 Fully-lined organza, rosette fabric with drop waist and cap sleeve. 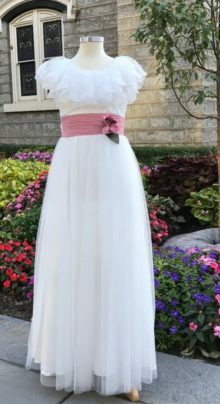 White grosgrain ribbon accentuates the waist. Don’t forget the tights to complete the look. 100% Polyester.